Would you ask Mother Mary to remove her Head-Scarf? This is not the first time - the islamic headscarf is in the spotlight of dispute. But in the name of secularity whenever this thing happened, i really felt bad. To me its a real attack on personal freedom and insensitivity (in a rather stupid fashion) to cultural and religious expression. When France imposed ban on headcarves in state schools, i had this question in my mind: If Mother Mary, one of the most revered personality by both Christians and Muslims, was alive today, would our so called secular society asked her to remove her headscarf as well? 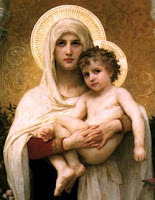 In any iconic depiction of Mother Mary, upon her be peace, you will see her head covered as it was (and still is) a symbol of modesty for women in many culture and tradition. Following that modesty in self-expression, Muslim women are encouraged to do the same. So do the Catholic Nuns as well. Just because Muslim women are not Catholic Nuns, that doesn't mean they are not devoted to God or they can not have their modesty in dress. Infact the headscarf is related to modesty and devotion to God from religious and spiritual perspective when it comes to Islamic perspective. Physical Nakedness or exposure that exceed limits is uncivilized, and it seems that our so called secular west wish to walk backwards in that direction whenever its possible. And if required they jump into making other to do so, if that means to take away headscarf from a woman's head. This recent news about the 11 year-old soccer player, Azzy in Canada is another example of such stupidity. What is the problem if a girl choose to play soccer with her head covered with a piece of cloth? Is that piece of covering a terrorist threat or a health hazard for other footballer? Isn't it extremism in the name of secularism? :: Viewpoints: Europe and the headscarf | The Islamic headscarf has become one of the most hotly disputed items of clothing in Europe. The French ban on headscarves in state schools comes into effect on 2 September, 2004 and politicians in Germany and Belgium want similar laws. BBC News Online asked eight commentators for their views on imposing a ban on the headscarf. Click to read more. Technology of the Heart: Would you ask Mother Mary to remove her Head-Scarf?